Krait on 25 September 2018, with the last few details being worked on ready for the event to mark 75 years since Operation Jaywick. Image: Kate Pentecost/ANMM. Today marks the 75th anniversary of Operation Jaywick, a joint Australian and British raid on Singapore Harbour — one of the most audacious and successful commando operations deep inside enemy territory during World War II. Krait, a former Japanese fishing boat, took three teams of Commandos and their folding canoes to Singapore Harbour. They attached magnetic limpet mines to the hulls of seven ships and fled the anchorage undetected. Early the next morning, six explosions shattered the darkness and six Japanese ships – 35,000 tonnes – were sunk or severely damaged. It was a significant blow to Japanese confidence and morale. 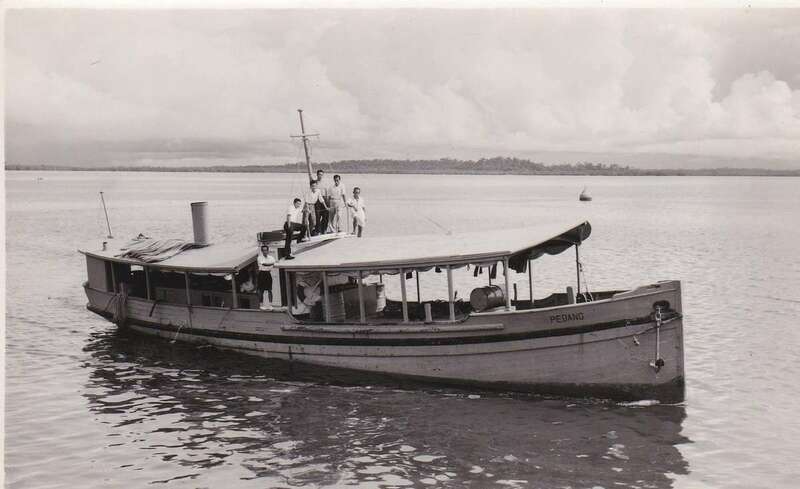 Krait, then known as Pedang in Sandakan Harbour, 1954. ANMM Collection 00055181. Operation Jaywick remained secret until the end of the war. 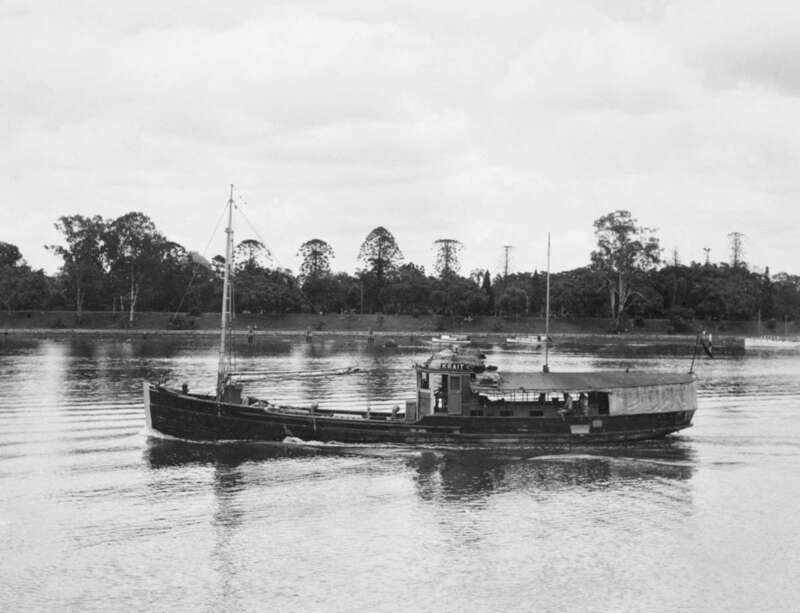 Krait survived the war and ended up as a workboat in the Borneo timber trade before it was recognized by Australians travelling in the region during the 1950s. A campaign was launched to bring it back to Australia, and in 1964 Krait returned. It then spent some time as a Royal Volunteer Coastal Patrol boat off the NSW coast. Krait was acquired by the Australian War Memorial (AWM) in the mid-1980s. 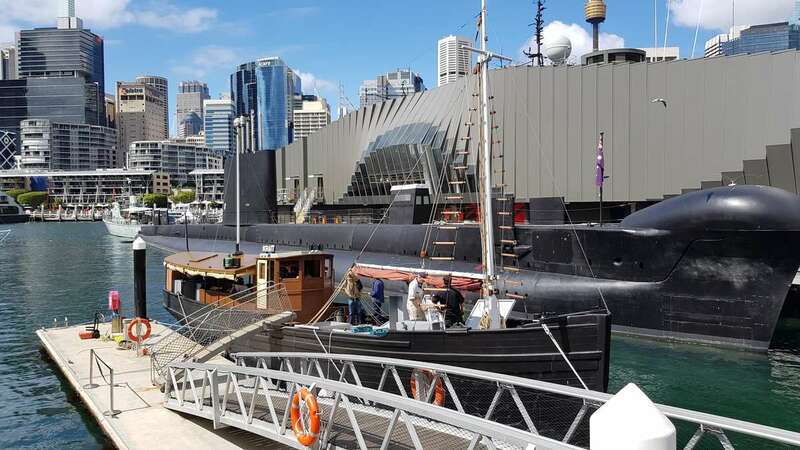 A partnership was formed between the AWM and the Australian National Maritime Museum to maintain Krait as part of our fleet, displaying it in the water at the museum’s wharves. Stripping the wheelhouse paintwork as part of the reconstruction overhaul. Image: Andrew Frolows/ANMM. 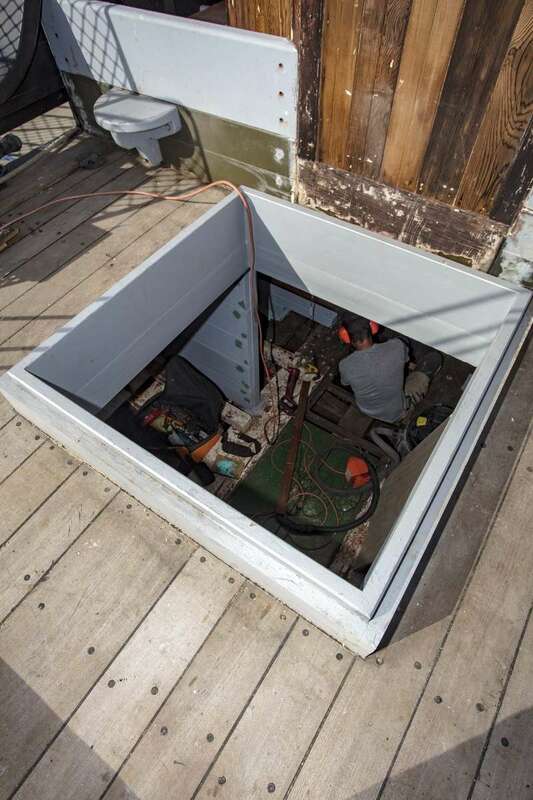 A new deck was installed to accommodate the placement of the hatches. Image: Andrew Frolows/ANMM. The interior of Krait was remodelled to reflect the vessel at the time of Operation Jaywick. Image: Andrew Frolows/ANMM. The museum’s conservation and fleet teams worked together to develop an appropriate paint scheme for the period. Image: Andrew Frolows/ANMM. The radio and the only reading matter The Sheik. Image: Andrew Frolows/ANMM. Riveting the new tanks. Image: Andrew Frolows/ANMM. 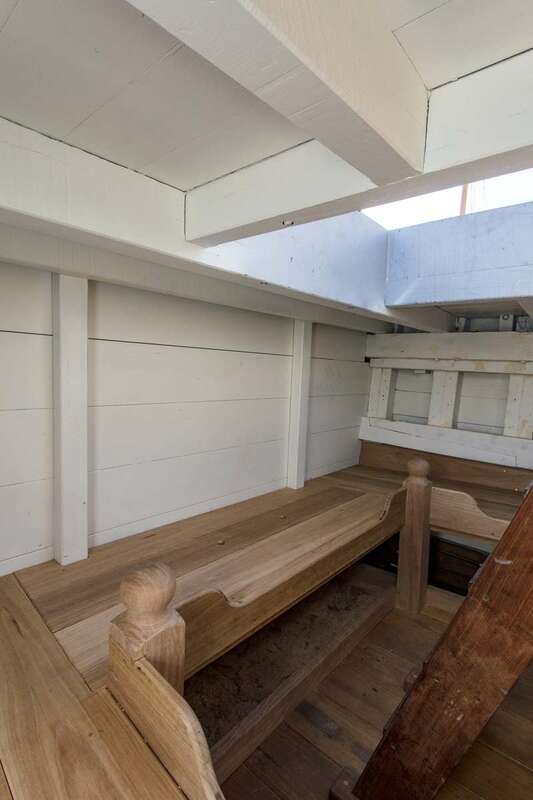 The aft deck tanks, galley, new cabin sides and curtains installed. Image: Andrew Frolows/ANMM. In 2014 the museum and AWM began a major long-term program to restore the craft to its 1943 configuration. Detailed plans of the layout and fit out were prepared using images and records from Operation Jaywick. 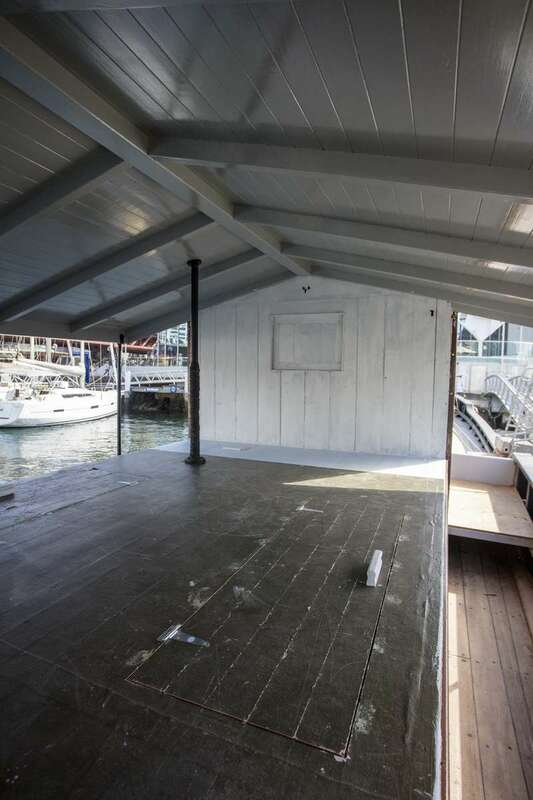 Important structural work was required: a new deck was needed to correctly place the hatches, the fragile bulwarks were replaced, a new awning with the correct construction and shape was made, bulkheads were restored to their original placement. 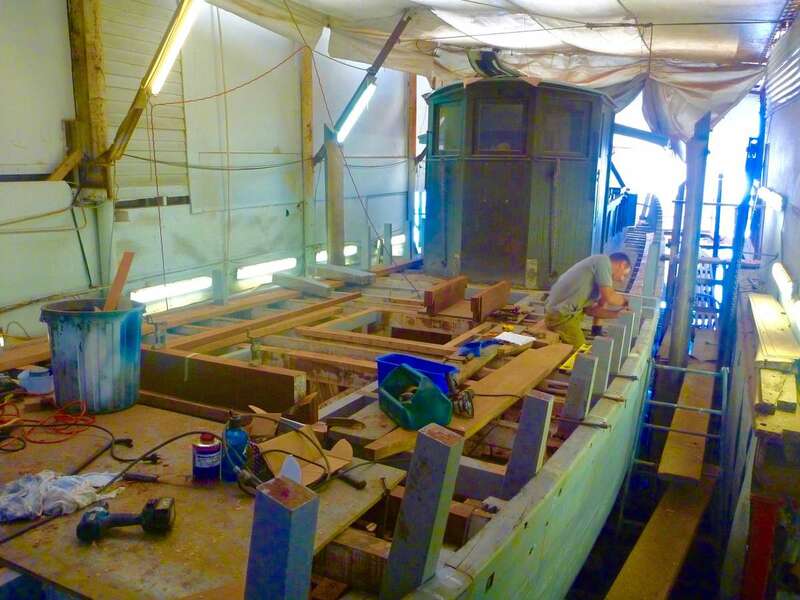 A considerable amount of the structural work, including additional work on the planking and frames, was carried out in 2017 by Michael Bartley Shipwrights. Work on restoring and replacing the planking and frames was largely carried out by Michael Bartley Shipwrights. Image: David Payne/ANMM. Getting the details right has been a challenge. Few the images were taken during the preparation for the operation and a several snapped on the voyage but are often not very clear and do not show fine details. Files from the National Archives of Australia, notes, diaries and previous publications on Krait provided more research material but in some instances, there was conflicting information. 95-year-old Moss Berryman is the only surviving member of Operation Jaywick and he reviewed the restoration plans. Even with Mr Berryman’s expertise, many aspects of Krait remained difficult to research, so the decision was made to restore the details as what was typical for the period, aiming to recreate the cramped but simple fit out it of the vessel. Rails, steps and a higher breakwater were added back in. The fishing net rollers and the guides on the molgogger beam up-forward have been replicated to maintain Krait’s cunning fishing boat disguise. New spars have been made, a sail is rolled up to replicate the rig plan and the awning once again features the navigation lights in their boxes. The long radio mast, aerial and hiding hatches are in the place as they were in 1943 where the crew could keep a lookout and, if required, fight back with machine guns. The colour scheme is authentic too: a black hull, brown superstructure and khaki awning. Krait on the Brisbane River 1943. Reproduced courtesy Australian War Memorial. AWM Collection 300915. 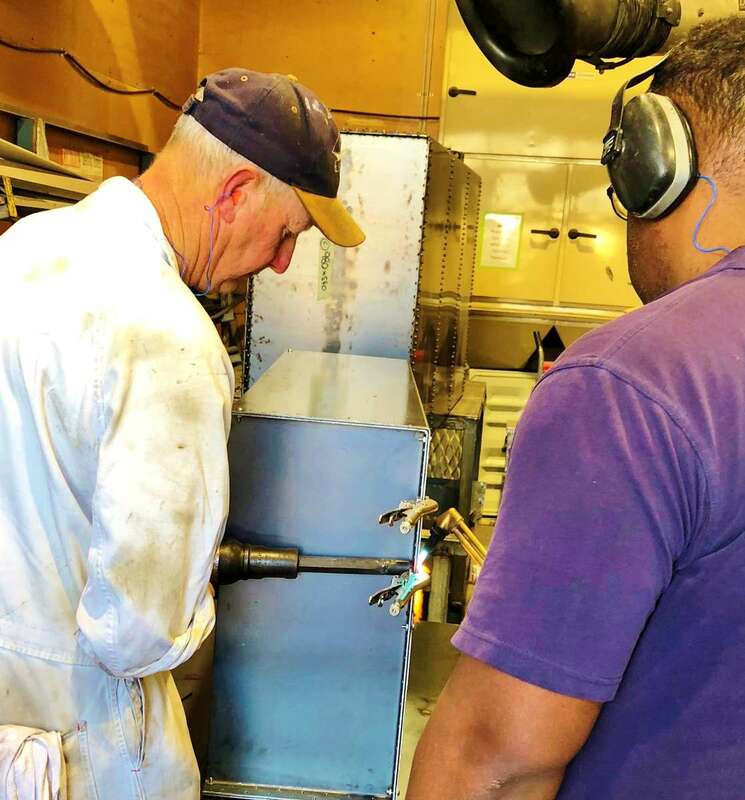 Below deck, the Gardner diesel engine and Rustin Hornby auxiliary have been overhauled and remain operational. Hold No. 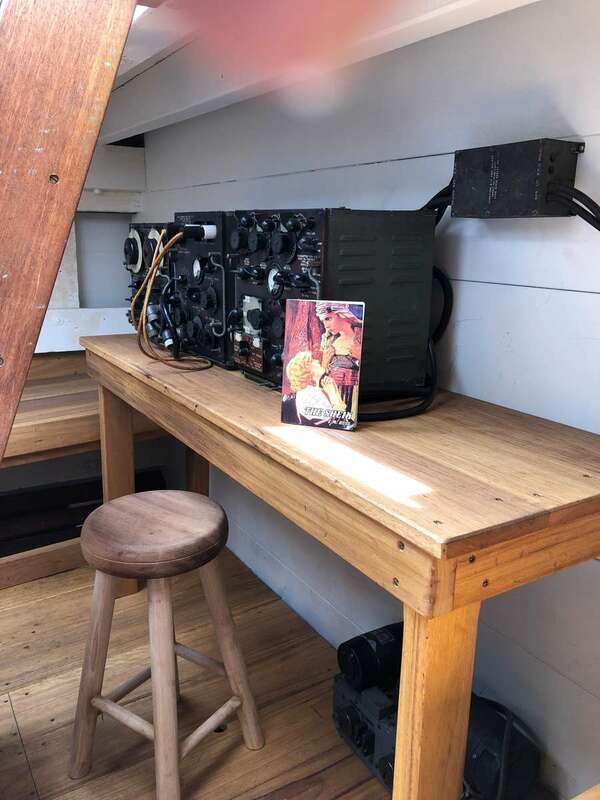 3 has been rebuilt as it was with bunks, a shelf and an exact version of the radio used. Fuel tanks and lockers have been reinstalled forward of the engine. On deck, the galley and stowage cupboards right aft, the two water thanks and gravity feed fuel tank are sitting where they were during Operation Jaywick. The engine room trunk has been closed in and the vent hatches cut back into the top. 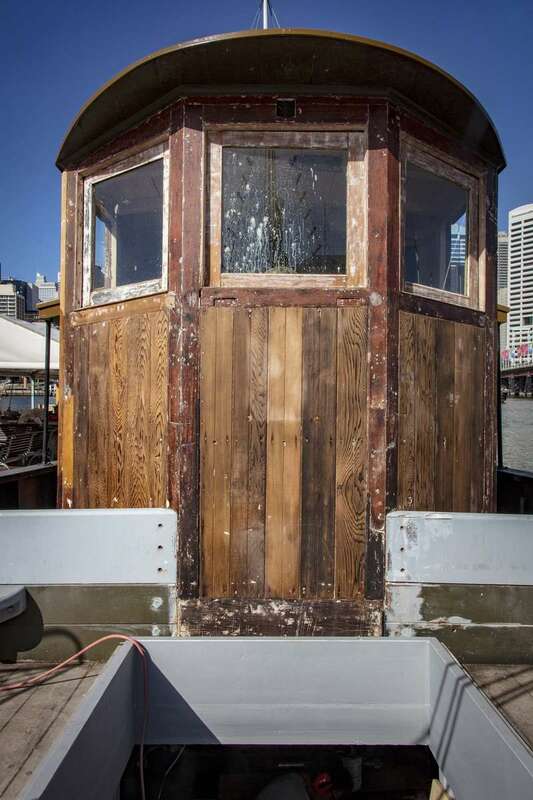 A set of lockers, which housed the commando’s guns, are once again on the back of the wheelhouse. 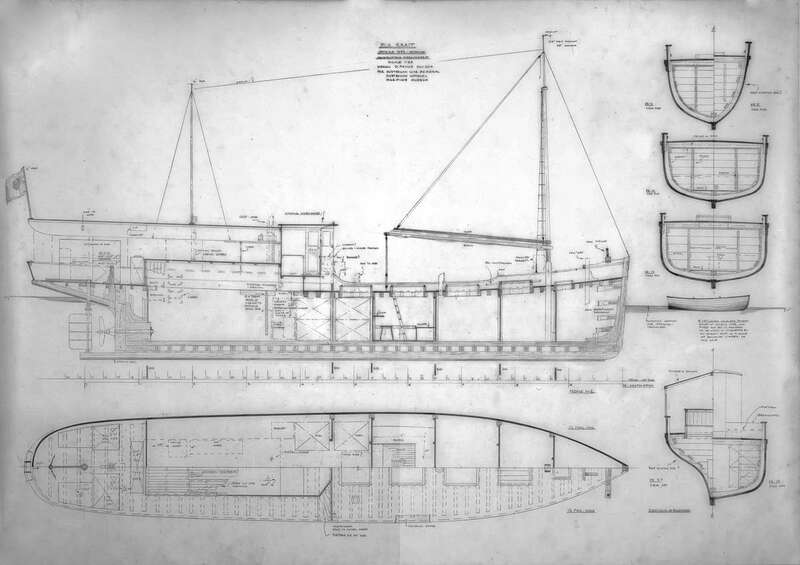 1: 24 scale plan of Krait, as drawn by David Payne in 2014, for the reconstruction project. Image: David Payne/ANMM. Amongst the props which add the finishing touches to the fit out is a folding canoe. The museum was very lucky to have a folding canoe from the period donated to us. The rare MK1** was built in the UK and sold as army surplus in Victoria after the war. The canoe was in the possession of the Hammond family and was almost lost during the Ash Wednesday fires in Victoria. The canoes used during Operation Jaywick were most likely the three-man version of this same model, but adapted for a two-man layout. Folding canoe MK1**. The canoes used during Operation Jaywick were most likely the three-man version of this same model but adapted for a two-man layout. Donated by Robyn Hammond. Image: David Payne/ANMM. Funding for this stage of the project has been supported by the Museum’s Foundation. 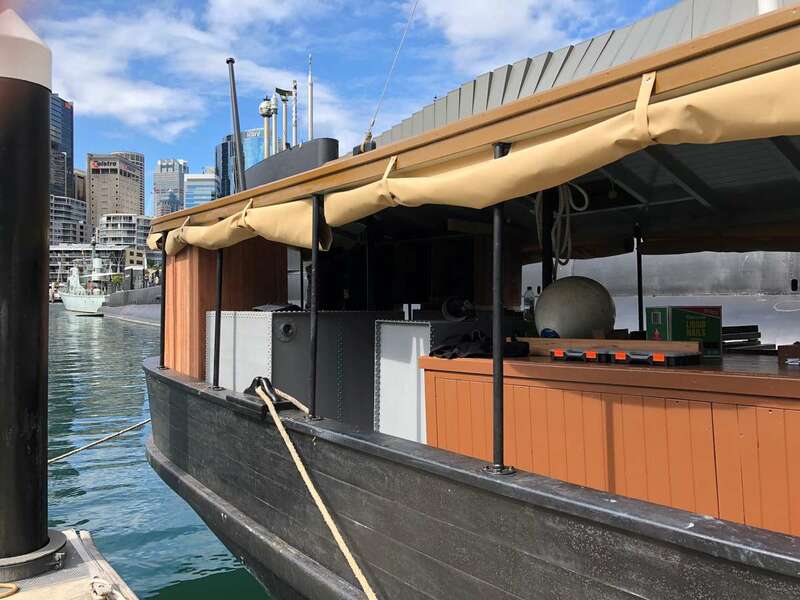 Many donors have contributed to the project and the Foundation held three inspection tours for donors to view the work and see how their support is recreating a rare and significant Australian vessel and its story. The Foundation continues to fundraise for MV Krait and donations can be made by on our website. — David Payne, Curator of Historic Vessels. Visit the restored Krait and see the new short documentary film Dark Victory, Operation Jaywick: Singapore:1943 about the mission and its consequences for the people in Singapore.